(Natural News) Our furry friends are such a vital part of the family that it can be devastating when one of them gets ill. Few things can tug at our heart strings more than a sick dog looking at us with big, sad eyes. And many dog lovers are gravely concerned at the recent outbreak of dog flu in Michigan, Ohio, Kentucky and California, which has affected over 100 dogs already. Should those of us who have dogs be worried about our own pets getting ill? And if your dog is already sick, should you be concerned about “catching” the flu from him? It is certainly true that the flu virus has been particularly devastating this year – in part, because the vaccines which medical practitioners punt as the best way to prevent the illness have proven to be especially useless this season. And it seems the flu virus is hitting our canine friends particularly hard this year, too. According to the Daily Mail, Cornell University College of Veterinary Medicine has reported that 72 dogs from California, 22 from Kentucky, 14 from Ohio, and one from Michigan, have already tested positive for the dog flu – and the flu season is far from over. The symptoms of dog flu are very similar to human flu, and include loss of appetite, a runny nose, fatigue and coughing. How sick your dog could become will also vary from not showing any symptoms at all, to pneumonia or even death. The Centers for Disease Control and Prevention (CDC) notes, however, that most dogs do not become very ill and recover within two to three weeks. The American Veterinary Medical Association has also reassured the public, explaining that the dog flu is only fatal in 10 percent of cases – a very low rate, considering very few dogs get infected in the first place. Nonetheless, it is understandable that some dog owners have grown concerned about catching the flu from their sick pets. However, experts say there is no reason to panic. Firstly, the two flu strains which affect dogs – an H3N8 virus and an H3N2 strain – are totally different to the strains which affect humans. While the CDC warns that since flu viruses are constantly evolving, it is theoretically “possible for a virus to change so that it could infect humans and spread easily between humans,” Amy Glaser, director of the Molecular Diagnostic Laboratory at Cornell’s Animal Health Diagnostic Center, insists that it is highly unlikely that a dog could pass the flu to a human – and in fact, there are no reported cases of this happening in the past. Pet owners do need to be aware, though, that they can pass the flu to their dogs. “We need to be aware that dogs and cats can sometimes be infected with human strains of influenza,” Glaser told the Mail. 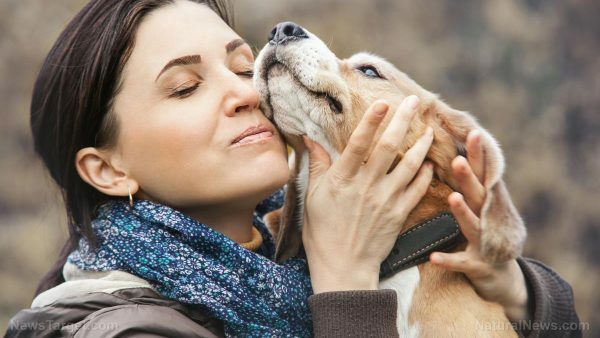 “So, if you have the flu, be aware that you could give it to your pet!” This could, in fact, be why flu numbers are up in dogs – because of so many cases of humans getting ill, and getting the vaccine, which spreads the flu. If you’re concerned that your dog might have the flu, a simple test swab test at your local veterinarian can confirm whether or not they’ve been infected. All infected dogs should be isolated from other pets until they get better.